Le Club Accorhotels has launched a great offer for stays at more than 170 hotels in Australia between November 1 – December 31, 2014, that are booked after October 1. You earn triple points for all points eligible stays (no booking of special rates required) and there is no limit on the number of points/stays. You must register for this offer on Accor’s website here. Classic (base) level members earn 15% back, Silver members 16%, Gold members 17% and Platinum members 18.5% before any other possible bonus points promotions offered. I like promotions that don’t require you to book a specific rate plan that can sometimes be inflated (you end up paying for the bonus points). This is a great offer for stays in Australia during the promotional period. 2. The offer is valid for reservations made at participating hotels in Australia between 1 October 2014 and 30 December 2014 (both dates inclusive) for every eligible stay between 1 November and 30 December 2014. 3. You must register for the offer by clicking on the “Connect” button and enter your member details to qualify for this offer. 5. You must book your stay ahead of time online via accorhotels.com or by calling Accor Call Centres to benefit from this offer. (Note bookings made via any other means including but not limited to; hotel direct, via a travel agent or online third party will not be eligible for the triple points). 6. The offer is available for multiple eligible stays within the promotion stay period on Le Club Accorhotels eligible rates (visit accorhotels.com/leclub for a listing of eligible rates). 7. 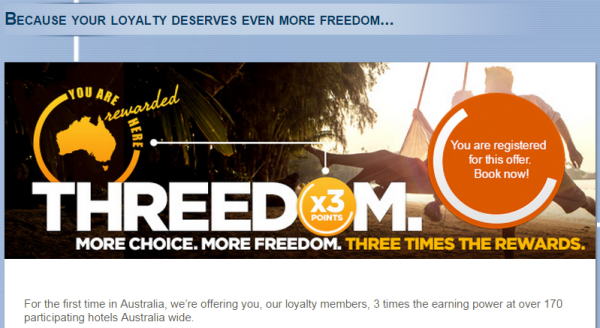 This offer entitles Le Club Accorhotels loyalty members, regardless of their status, to benefit from earning triple points at participating hotels in this offer. 9. Your Le Club Accorhotels points will be credited to your membership account from 10 days after your check-out date. 10. Reservations that include several rooms covered by the same member during his or her stay are only counted as one stay.